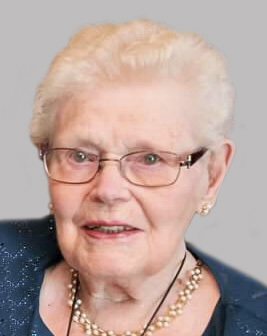 Obituary for Anne E. (Keeley) Harmon | Hamp Funeral Home, Inc.
Anne (nee Keeley) Harmon, age 95, of Tonawanda, died Saturday, March 16, 2019 at Niagara Hospice House. Born March 26, 1923 in Lockport, she was the daughter of the late Frederick and Mary (nee Daly) Keeley. A resident of Tonawanda for more than 60 years, Anne was a registered nurse. She was an active member of St. Francis of Assisi Parish and received the St. Joseph the Worker Award from the Diocese of Buffalo. Anne enjoyed gardening, reading, crossword puzzles, and especially her church and family. She was the wife of the late Vincent J. Harmon, who died February 16, 1999; mother of Patricia (James) Stuff of Tonawanda, Mary (Thomas) Smith of Lewiston and the late Michael Harmon; grandmother of Rutheve (Erik) Marciniak, Sarabeth (Joshua) Simonson, Christopher (Erika) Stuff, Timothy P. Stuff, Lauren E. Stuff, Nathan (Karlee) Smith, and Catherine A. Smith; and sister of Mary Feerick of Bellingham, Massachusetts and the late James Keeley. Also surviving are 8 great-grandchildren and many nieces and nephews. Friends may call from 4-8 PM on Wednesday only at the HAMP FUNERAL HOME, Inc., 37 Adam Street at Seymour, Tonawanda. A Mass of Christian Burial will be celebrated at 10 AM Thursday at St. Francis of Assisi Church, 150 Broad Street at Clinton Park, Tonawanda; the Rev. Michael Uebler officiating. Friends invited. Interment at White Chapel Memorial Park, Town of Amherst. If desired, memorials to the St. Francis of Assisi Outreach, 73 Adam Street, Tonawanda, NY 14150, are preferred by the family.